The 1st Amendment is only three sentences long, but it is one of the most comprehensive and important clauses in our Constitution—it is what prevents our politicians from imposing their religion on the rest of us, ensures that we have the right to speak freely and criticize our government, and protects the press from being forced to propagandize for those in power. Unfortunately, over the past few years, the conservative majority on our Supreme Court has rendered several decisions that have distorted the 1st Amendment. Because of their rulings, corporations are being granted the rights that have previously only belonged to humans, religious freedoms are being eroded, and the application of the 1st Amendment has become inconsistent. 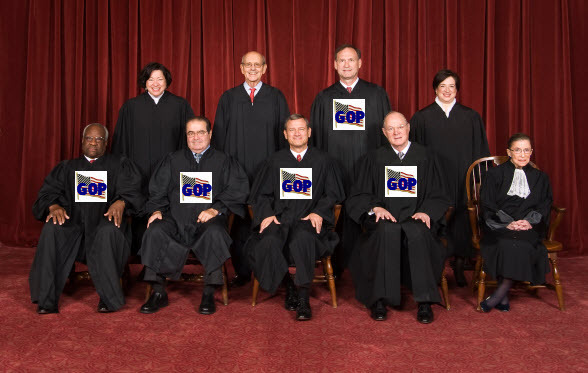 In effect, the right wing Supreme Court majority has rewritten the 1st Amendment from the bench to serve their corporatist and theocratic ideology. They have betrayed their duty to simply interpret the law and have become a cabal of five unaccountable legislators who can impose their opinions on the rest of the country, no matter how unprecedented or unpopular those opinions may be. Just recently, the Supreme Court rendered two decisions that are extremely damaging to the religious protections enshrined in the 1st Amendment. These decisions have allowed those with monetary power or majority status to start imposing their religion on those less fortunate or populous. In the Greece v. Galloway case, the right wing Supreme Court majority ruled that public meetings in cities and towns could be opened with denominational official prayers. 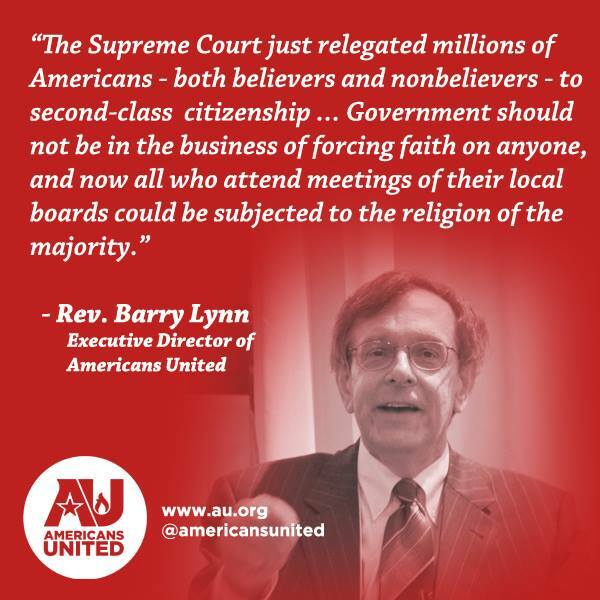 This ruling flies in the face of the establishment clause of the 1st Amendment by allowing the government to sponsor a religion through offering it preferential treatment during official meetings. There simply isn’t enough time to give every religion (as well as non-religion) equal time, so this preference is inevitable. The Greece case creates a very dangerous precedent that allows private religious dogma to infringe upon the public square. Everybody has a right to believe what they will and visit a house of worship, but this decision lets the majority belief gain preferential status that results in a de-facto official sponsorship. Last Monday, the Supreme Court dealt a truly massive blow to religious freedom when they decided the Burwell v. Hobby Lobby Stores in favor of letting “religious” corporations use their religion to get out of laws that they object to. 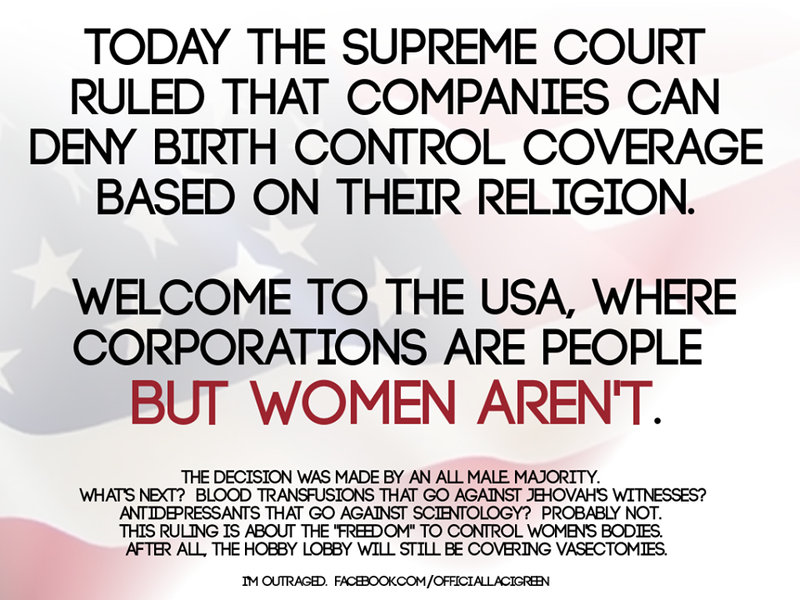 According to this decision, a closely held corporation (a corporation where 50% of the stock is owned by five or fewer individuals) where the owners are religious will be exempted from the ACA contraception mandate, on the grounds that they object to paying for another person’s birth control. The Burwell decision represents the first time in our history that corporations have been granted religious protections. The ramifications of this decision simply cannot be overstated and we have already seen a ripple effect starting, where religious owners of corporations ask for exemptions from laws that offend them. Specifically, over a dozen corporations have asked for exemptions to anti-discrimination rules that force them to hire homosexuals despite the fact that they have religious objections to their existence. While the Supreme Court majority argued that this expansion of religious protections was limited to contraception, there is no Constitutional way to prevent this precedent from spreading. If one belief is worthy of such an exemption, there is no way to argue that similar beliefs (ex. an objection to vaccination or blood transfusions) are not similarly protected—such a parsing of beliefs would amount to preferential treatment for a specific set of beliefs that would violate the establishment clause of the 1st Amendment. In short, the Supreme Court has torn off the lid to Pandora’s box and there is little that can be done to prevent wealthy zealots from violating virtually any law that they argue offends them. If the owners of a “corporate person” object to minimum wages, worker protections, anti-discrimination measures, health insurance requirements, or even safety standards, they need only mask their arguments in a thin veneer of religiosity to insulate themselves from consequences. In addition to perverting the religious freedom provision of the 1st Amendment, the Supreme Court has caused immense damage to the sections that deal with the freedom of speech. 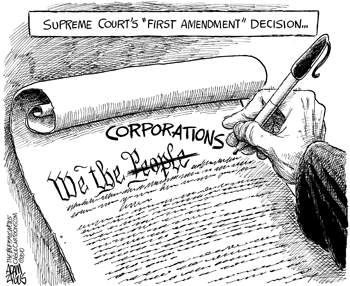 In the 2010 Citizens United v. FEC case, the right wing block of the Supreme Court decided that corporations have speech rights protected under the 1st Amendment. This decision represents the first time that any major court, has found that a non-person legal fiction should be accorded the same 1st Amendment protections that real humans are. The corporate “right to speak” manifests as the “rights” to spend virtually unlimited sums of money buying our politicians and to run ungodly numbers of political ads (if you watched TV in a swing state during 2012, you were likely bombarded with over a dozen political ads every hour). The ramifications of Citizens United have been dramatic and have set the stage for uncontrollable corruption in our political system. In the post-Citizens United political climate, politicians are forced to raise money from large corporate interests and are extremely wary of passing any law that would cut into their fundraising ability (ex. voting for increased coal regulations makes it less likely that coal manufacturers will donate to you). To further compound the damage from Citizens United, the Supreme Court eliminated the aggregate campaign limits with their McCutcheon v. FEC decision. This decision found that restricting monetary donations to elected officials in an effort to combat corruption was an illegal infringement on free speech. Their reasoning was that since corporations are people and money equals speech, restricting individuals and corporations from “speaking” to each and every politician would be the moral equivalent to restricting the amount of time that each American can spend speaking freely. Put simply, this legal reasoning is bent enough to make a contortionist blush, and based upon two faulty premises, one of which was created only four years ago by this very court. 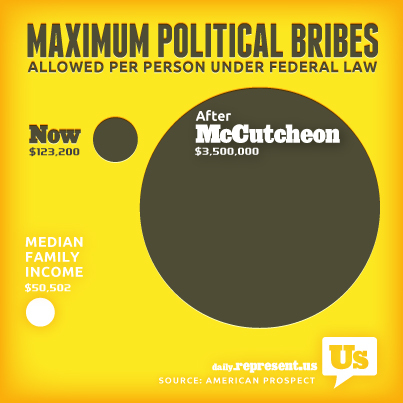 While we have yet to go through a major election cycle in the time since the McCutcheon decision, the results are obvious. Now that uber-wealthy individuals and corporations can spend more money buying our politicians, they will do so and our politics will get even more corrupt. Last week, the Supreme Court ruled on McCullen v. Coakley and declared buffer zones surrounding abortion clinics to be unconstitutional. Unlike all of the other cases mentioned in this article, the decision was determined with a 9-0 ruling, not a 5-4 conservative split—that said, the issue remains that the 1st Amendment is being unequally and inconsistently applied. It has long been held that the 1st Amendment is not unlimited and that some types of speech must be restricted because the harm that the speech causes eclipses the damage to freedom from restricting it (the stereotypical example of such a restricted type of speech is a person yelling fire in a crowded theater). This balance has been used in the past to justify the creation of buffer zones around certain sensitive gatherings, where protesters have their rights to speak curtailed. Until recently, these restricted areas included abortion clinics, military funerals, federal courthouses, and even the Supreme Court itself. 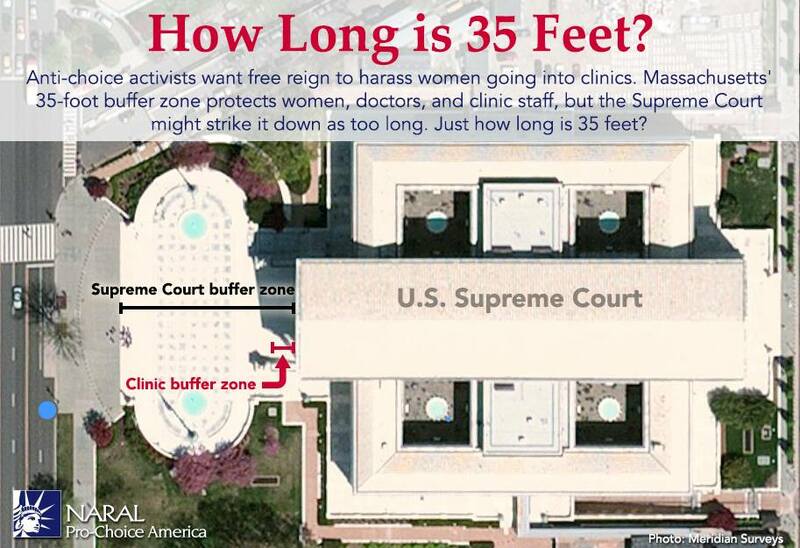 In the McCullen case, it was determined that a buffer zone surrounding an abortion clinic is an unconstitutional infringement on the right of a protester to speak (read: yell in the faces of desperate women as they go through a very tough situation). This decision, in and of itself, is not actually controversial, as it is very easy to interpret the 1st Amendment as a prohibition of all buffer zones and an absolutist right to assemble and speak. If the Supreme Court were consistent in their interpretation of the 1st Amendment, there would be no bias or controversy surrounding their decision to eliminate any one specific form of buffer zone. Unfortunately, there exists a disparity in the Supreme Court’s interpretation of the 1st Amendment that has led them to invalidate the buffer zones surrounding abortion clinics, while upholding the buffer zones surrounding other sensitive locations. This disparity is constitutionally irreconcilable—if you can justify a buffer zone at a soldier’s funeral, you cannot argue later than a similar buffer zone is unconstitutional when it protects another target for harassment—and is likely a result of the Justices letting their internal biases color their decision-making. If the Supreme Court had only made one questionable ruling in regard to the 1st Amendment, it would be unfair to say that they were engaged in a campaign to subvert its meaning and rewrite the Constitution from the bench. Unfortunately, we have a series of extremely questionable Supreme Court cases to look back on in just the past five years, and it has become apparent that the conservatives on the court are engaged in such a campaign. It appears to me, that two of the three branches of the US government are rotting. We are truly lost. Our Constitution might as well be torn up and sent flying with the other confetti in a ticker tape parade.